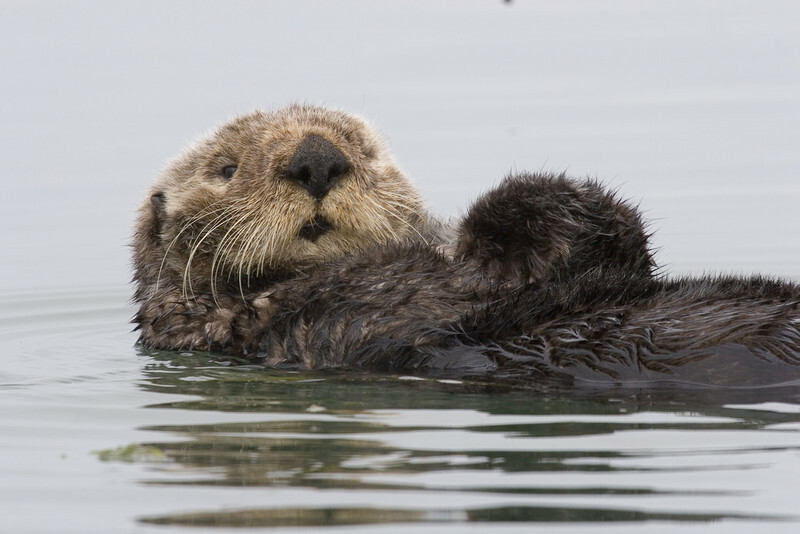 OAKLAND, Calif.— Most marine mammals and sea turtles in the United States that are protected by the Endangered Species Act are recovering, according to a peer-reviewed study published today by the academic journal PLOS ONE. Among the 31 populations studied, 78 percent of marine mammals and 75 percent of sea turtles increased their population size after protection under the Endangered Species Act. Just 9 percent (two populations) of marine mammals declined, and no sea turtle populations decreased. Overall 77 percent of mammal and turtle populations increased, while 6 percent declined. Sixteen percent had no discernable trend, which may indicate long-term population stability. The median population increase, after protection under the Act, was 115 percent for marine mammals and 980 percent for sea turtles. 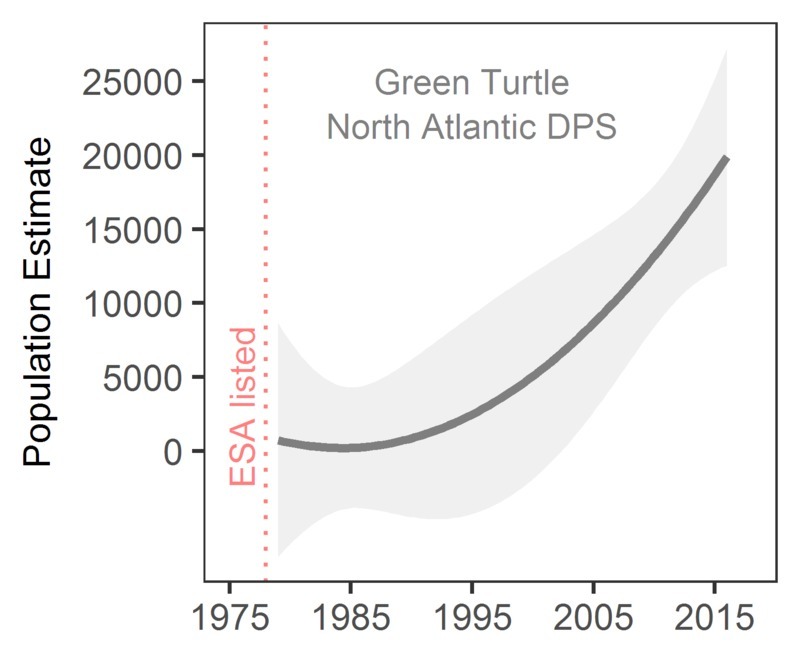 The study examined the long-term population data of all U.S. endangered sea turtles and marine mammals, finding that 31 had datasets of sufficient length and quality to determine the population trend after federal protection was granted. 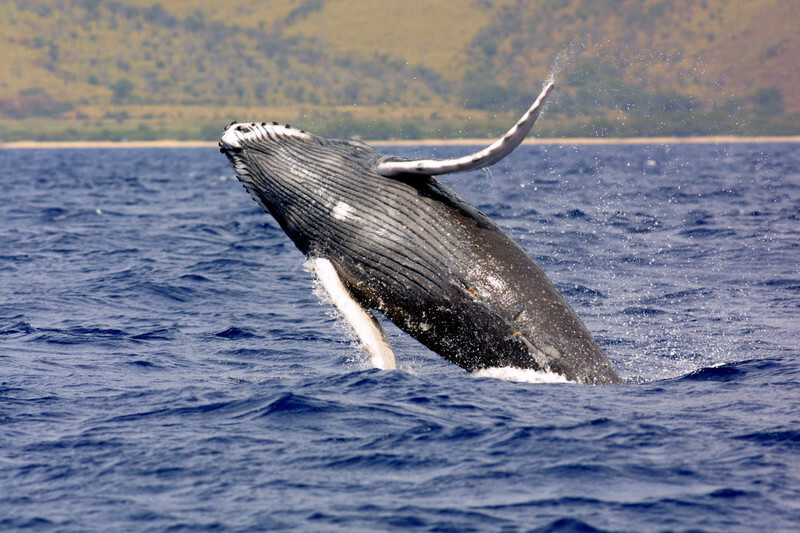 Hawaiian humpback whales, which give birth in the waters off the main Hawaiian Islands and forage in the waters off Southeast Alaska, increased from just 800 whales in 1979 to more than 10,000 in 2005. They were declared fully recovered and removed from the endangered species list in 2016 after being protected since 1970. North Atlantic green sea turtles increased from 464 nests on scientifically standardized Florida beaches in 1989 to 39,000 in 2017 after being protected in 1978. The total statewide population increased from 62 known nests in 1979 to 53,102 in 2017. 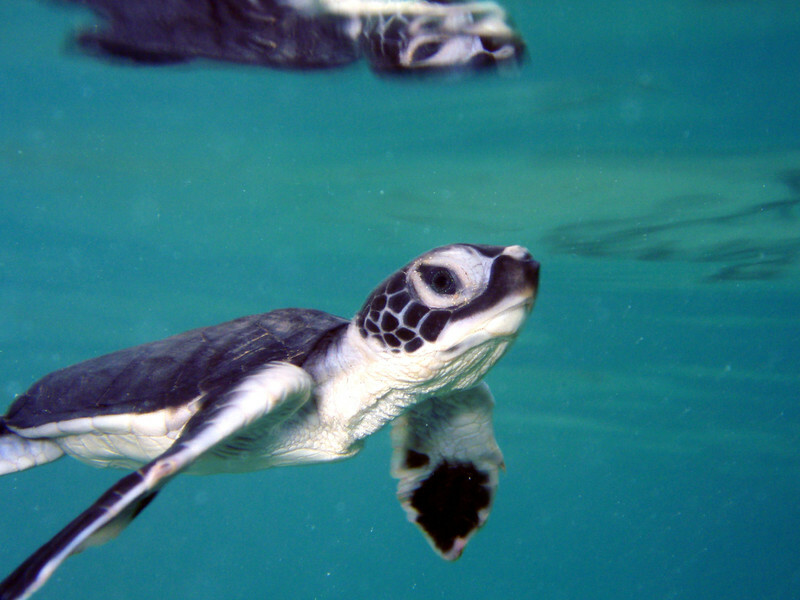 Green sea turtles benefitted from a ban on killing turtles and harvesting eggs, protections for nesting beaches, and measures to reduce deaths in fishing gear. Eastern Steller sea lions increased along the Pacific coast from California to Alaska from 19,103 to 59,968 individuals between 1990 and 2013 due to protection of their major haul-out areas and rookeries. They were declared fully recovered and removed from the endangered species list in 2013. 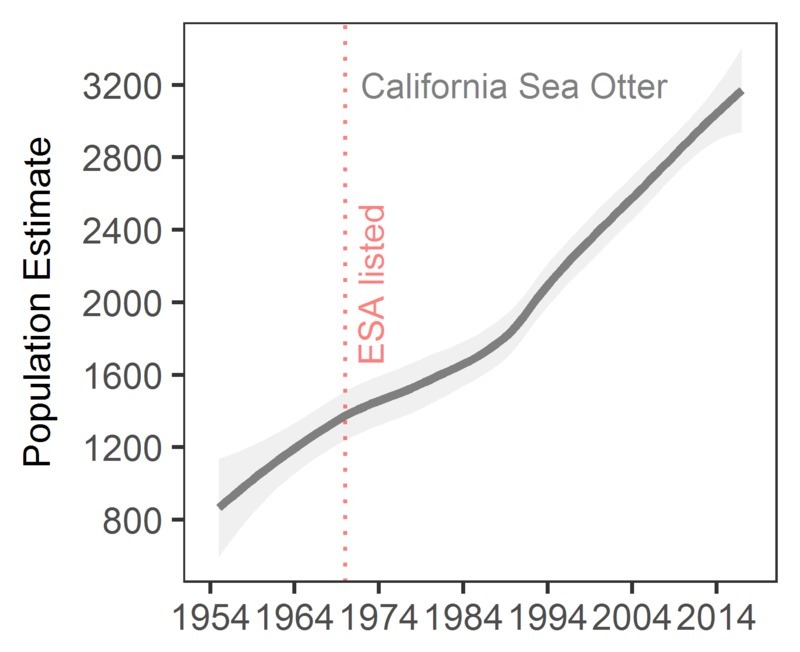 Southern sea otters, North America’s smallest marine mammals, live along the central California coast, where they increased from 1,443 to 2,688 individuals between 1979 and 2017 and are now near to their federal recovery goal. Their recovery has been pivotal in improving the health of coastal kelp forest ecosystems. Not surprisingly the study found that successful conservation takes time: Species protected for more than 20 years were more likely to be recovering than recently protected species. 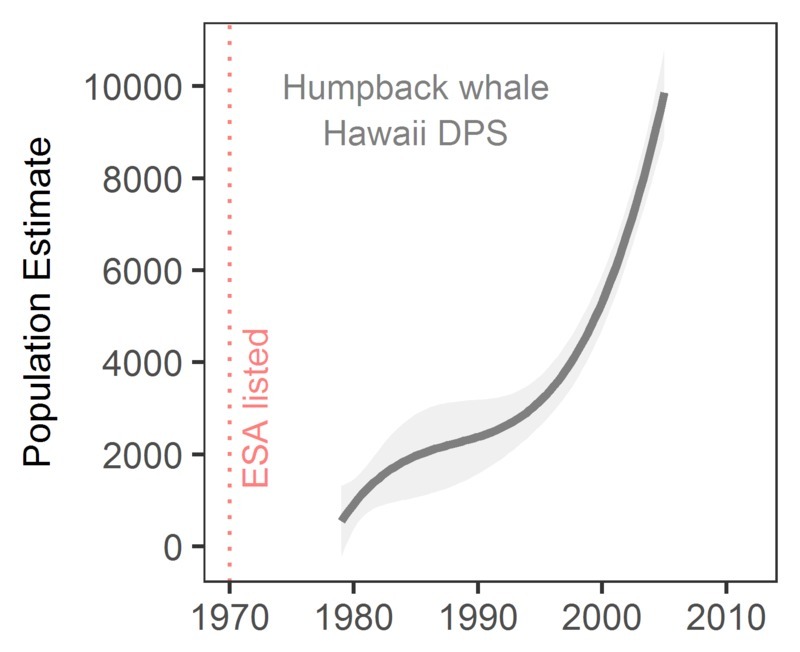 The only species to decline after Endangered Species Act protection are the Hawaiian monk seal and Southern Resident killer whale. The former is currently increasing, however, while the latter continues to decline, largely because the federal government has failed to protect their full habitat or take other steps called for by the Act. Conservation measures triggered by the Endangered Species Act include habitat protections, science-based management measures to reduce key threats and safeguard the species, and recovery planning. The Act has required devices that allow sea turtles to escape from fishing nets, protected whales from approaching vessels, and reduced disorienting lighting from sea turtle nesting beaches. International conservation efforts have also promoted population recovery. The study, titled “Marine mammals and sea turtles listed under the Endangered Species Act are recovering,” was authored by Valdivia, Wolf and Center Executive Director Kierán Suckling. Marine mammals and sea turtles make up 38 percent of the 163 marine species listed under the Act. Green sea turtle photo by Mark Sullivan, acquired under NOAA permit 1013707. Humpback whale photo courtesy NOAA. California sea otter photo by Mike Baird. Graphs by Abel Valdivia, Center for Biological Diversity. Images are available for media use.